Some people believe that the Old Course was formed by nature rather than by man. This is, unfortunately untrue. Soon after Old Tom Morris was appointed greenskeeper in 1865 he started work, replacing heather on the fairways with turf. But while man has shaped the Old Course, it has never been altered merely for the sake of it, or to follow trends. The philosophy of those who look after the Old Course is summed up in this quote from the official guidebook. St Andrews Photo: Iain M Lowe "A wise man does not throw away all his Da Vincis to make way for Picassos or Hockneys, or replace Michael Angelo's David with a work by Moore on the strength of the fashion of a few decades against which stands the judgement of centuries. We have no intention of reworking our own "Old Master" to suit each transient taste." To underline the point further, in 1869, a bunker was removed from the course, filled in by the greenskeepers. It was re-dug overnight by the townspeople. 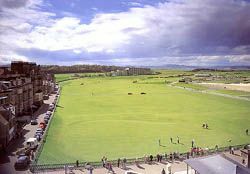 Contrary to popular belief, the Royal and Ancient Golf Club does not own the links at St. Andrews. The course is publicly owned, administered by the St. Andrews Links Trust. Until 1912 playing on the course was free of charge to all and St. Andrews residents only started paying in 1946. 1759 marked the earliest reference to stroke-play, at St. Andrews. Previously, all play was match. In 1764, the St Andrews Old Course was 11 holes; golfers would play out 11 holes and then play the same holes in reverse coming in, thus playing 22 holes. In 1797, St Andrews Town Council, which at that time was bankrupt, sold the links to local merchants to raise funds. The merchants turned the course into a rabbit farm. This move created unrest among the golfers, and for 20 years a feud, between the rabbit farmers and the golfers, was fought, with the golfers coming out on top in 1821. James Cheape of Strathtyrum, a landowner and avid golfer, purchased the land and returned it to the golfers. 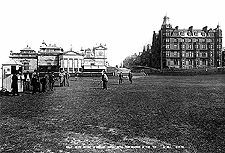 Golf at St Andrews in the middle 19th century was becoming increasingly popular, and the courses were becoming crowded. Golfers playing out began to meet golfers playing in, at the same hole. This led to problems, and arguments between players. Something had to be done.It was solved by cutting two holes on each green, with white flags for the holes going out, and red flags for the inward holes. This was how the famous double greens came into being. The course was then played clockwise and anti-clockwise on alternate weeks. Nowadays the left-hand or clockwise course is hardly ever used but some of the bunkers are still obviously intended as obstacles for players going in this direction. The first four holes, (also the last four) on the course were judged too short so they decided to combine them into 2 longer holes. The 22 hole course became 18 holes and the game of golf has been played over 18 holes ever since. In 1767, James Durham at St. Andrews carded a score of 94 in the Silver Cup, setting a record that remained unbroken for 86 years. One simple track carved through the bushes and heather has developed into six golf courses. There are five 18-hole courses and one 9-hole course, giving 99 holes in all. St Andrews Links is the largest golfing complex in Europe. The facility attracts around 180,000 golfing pilgrims from around the globe annually. All the golf courses at St Andrews Links are public - open for all the golfers who wish to play it. From Monday to Saturday, a ballot for starting times determines most play on the Old Course. Entry to the ballot must be made to the Starter, on the previous golfing day. You have to produce a handicap card or a letter of introduction from your club in order to be included in the ballot. It does not matter what your handicap is, just that you are a serious enough player to have one, or be able to have someone vouch for you. On Sundays the course is closed, and locals stroll around the links. St Andrews is open year round, except for two weeks in February and two weeks in November. Currently, a round of golf on the old course will cost £72, and you must also play another of the courses in the facility, at about half that price. Fairway mats, like driving range mats, are in use from December to March, to give the turf a respite. Golfers must lift their balls and play from the mats. During this period you can play for £34.